Taking place in Tehran just as the war enters its eighth year, the thriller follows a mother and her young daughter struggling to survive a brutal bombing campaign whilst also dealing with a supernatural evil that haunts their apartment. Creating the final look for the film with the help of DaVinci Resolve Studio was Creativity Media colorist Filipe Fernandes and director of photography (DP) Kit Fraser. "I've known Babak, the director for "Under the Shadow", and Patrick Fischer, who owns Creativity Media, since I was at university," begins Fraser. "We've been close friends for about thirteen years. Babak and I shot a short film together back in 2012, and then finally began developing the project that would become "Under the Shadow." Having known each other for as long as we have, working on "Under the Shadow" together came naturally to the trio, who provided the full postproduction for the film through Creativity Media, as well as co-financing the project with his finance company, Creativity Capital. "All three of us have been involved in the process since its inception," Fraser continues. "From when Babak wrote the first synopsis, to the treatment and script up until finding the financing and shooting, which all took just under three years. My work, however, really started during the four weeks of preproduction. That was followed by a four week shoot, and a final grade that took nine days to complete." To develop the look for "Under the Shadow", Anvari and Fraser initially took inspiration from Anvari's memories and their research of the time period, as well as films such as Iranian drama "A Separation", which was used as a visual reference for tone and aesthetic, along with "Children of Men" for its camera work. The final look in terms of color grading, however, was only truly determined once the team flew to Jordan for the shoot. "For budgetary reasons we decided not to shoot in RAW , opting for ProRes instead," reveals Fraser. "90 per cent of the work I normally shoot is RAW, so I was definitely concerned. I needn't have worried though! To my complete surprise, there wasn't one situation throughout the grade in which I felt prohibited, just because there was so much we could do with DaVinci Resolve." "We all knew that "Under the Shadow" was going to be a horrific, psychological thriller centered around this one apartment, so one of our biggest challenges was to maintain the tension throughout," adds colorist, Felipe Fernandes. "From day one of the film shoot, I was briefed to create a very strong look that would make everything feel quite stressed and claustrophobic. Ultimately, Babak and Kit decided on the sickly yellow green hue that you can see in the film today." "It's not a color you see in a lot of films, but especially not a film which is based solely in one apartment, like "Under the Shadow"," tells Fraser. "It's really the opposite of welcoming and worked perfectly when combined with the detail that went into the camera work and lighting for maintaining tension." As the decision was made to start with a natural aesthetic on "Under the Shadow" which would then evolve into a more stylized grade as the film unfolds, another major challenge for Fernandes became enhancing the preexisting lighting and shadows shot on set. This would ensure the audience's eyes were always drawn towards a specific element in each frame. "That was one of the main aspects of the grading work," explains Fraser. "We had a vast amount of long shots, some of which lasted for more than two minutes, and on top of that we're constantly traveling to lots of different rooms in the apartment. There was only so much the production team could do with the lighting of some sequences, particularly on our budget. 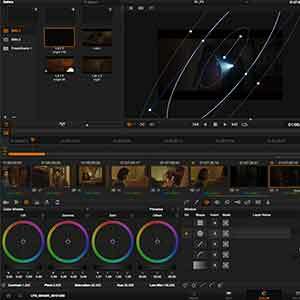 That's where DaVinci Resolve stepped in, especially in scenes where audiences would have a 360 degree view of a room." Using tools such as Power Windows, Fernandes worked in Resolve to highlight and darken specific areas of the shots, all while making sure to maintain the subtlety needed in the grade. "Anyone with any experience in grading will know how tricky any continuous shots that jump from room to can be compared with a simple, stable shot," says Fernandes. "That's where Resolve really stands out. It made my life very easy, particularly with elements such as keyframes and the ability to make shapes work." "That was a huge bonus on a small budget, independent feature," agrees Fraser. "It was the difference between me and Anvari needing to put up large flags or other physical elements to try to slowly shape the shadows in principle photography, and simply creating those shadows and gradients later in the grade. Using Resolve was a massive time saver." "Under the Shadow" has received wide critical recognition with the Sundance Midnight screening selection. "This is one of the best projects I've ever worked on," affirms Fernandes. "Babak and Kit are both so talented and we already had such a great relationship with them at Creativity Media through Patrick. It made working together really fun and easy." "It was fantastic to work with everyone again to make such a tense piece of filmmaking," concludes Fraser. "'Under the Shadow" is truly beyond a generic thriller piece. There are a lot of deeper political themes coming across, as well as an exploration into the relationship between the characters of a mother and a daughter. I hope audiences really get to appreciate the craft, especially from Babak, that went into it."